Apple mobile iOS devices (iPads, iPhones, and iPod Touches) are used by 130 million people, but they present a huge blindspot to advertisers. All Apple mobile devices use the Safari browser, as do millions of Apple laptop and desktop computers. Safari blocks third-party cookies by default, which is good for privacy and good for consumers. But it is bad for advertisers who rely on browser cookie tracking to measure the effectiveness of their ads. 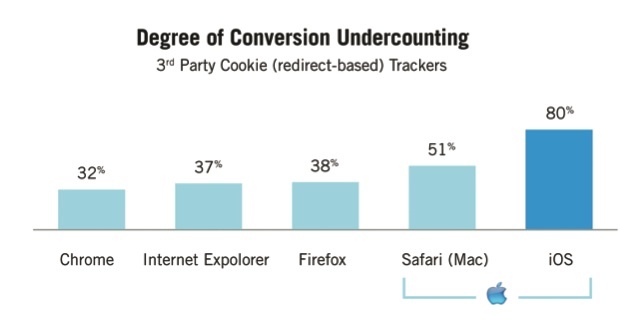 Marin Software, which offers a way to manage paid search advertising, conducted a study it provided to TechCrunch which shows that 80 percent of the time iOS devices don’t count paid-search conversions (i.e., clicks) because cookie-tracking is turned off. On the Mac, the undercounting occurs 50 percent of the time. All told, when you count all browsers, 38 percent of all paid-search clicks are not being counted. These numbers are for so-called third-party cookies, not first-party cookies which come only from Websites you visit. Third-party cookies are served from various advertising networks or monitoring tools, and they are required for any type of retargeting across multiple Websites. While Marin only looked at paid search ad conversions, the numbers should hold true for display ads as well. Not only are ads not being tracked properly on most Apple devices, but if they were tracked properly, Marin suggests that Apple devices actually perform better. 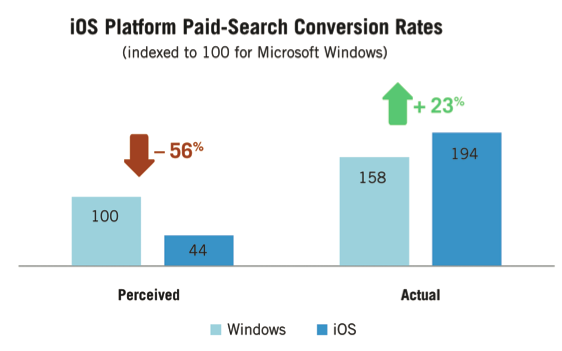 As part of the study, Marin compared actual ad conversions to Windows computers as a baseline. While the perceived conversion rate of search ads is 56 percent lower because of the undercounting, the actual conversion rate is 23 percent higher. Following the maxim that you don’t get paid for what can’t be measured, this blindspot poses a growing challenge to the online advertising industry, and Google in particular. (And you thought Apple was just doing this to protect consumers). The way around the blindspot is to use first-party cookies served from the Websites people visit, or to come up with better ways to measure the performance of online ads. But that’s the topic for another post.